l haven’t been crafting a whole lot this week as I have been sewing for my little. I have a birthday and a Easter dresses to finish before the end March so I have to sew, sew sew! So, I will just show you some pictures and call it a day. Here is the next page in my India themed art journal. The other two are The Pensive Sarod Player and I Am Unique. In this journal, I have been challenging myself to get more creative with my backgrounds. 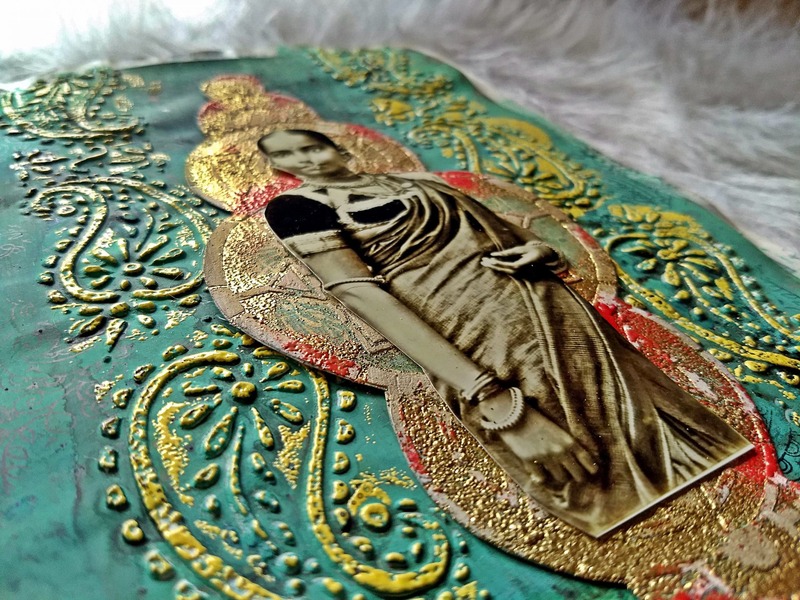 On this page I used the StencilGirl Pilgrimage to India with Grunge paste. Fresco Finish Paints and Infusions were layered in the background. I detailed the stencil with embossing powder by rubbing embossing ink over the stencil. I Love this bright color yellow. The frame around the photo is from the StencilGirl Art Deco Borders, embossed in gold and red. The stamping in the background is by Pink Paislee. I made my own embellishment using some twine, chipboard, canvas key and beads. Yet another journal entry that has stolen my heart. I have been working on a 7 continent journal/altered book for about 13 years, and I have never created a page as lovely as this one, or your previous India inspired pages. I like how you focused on the background and the stencil, but most of all, I like the colors that are rich in Indian history. Thanks for sharing this beautiful page with us at Art Journal Journey, Kate. It’s a beauty. Fabulous page with great textures! That key om its keyering is such a cool idea and the whole spread has such an Indian feel to it!! Good luck with your sewing peojects and happy weekend! Those spread is simply ADORABLE! WOW! Thank you very much for joining us again at Art Journal Journey Kate! This is much appreciated! Happy weekend to you! And thanks for joining us at AJJ too! Gorgeous pages! Love your layout design Kate-the stenciling is perfect! So opulent and exotic – just what we need in these bleak grey January days. Beautiful work. I am loving the gold and green together, my friend. Such beautiful and elegant colors. And your sewing projects sound marvelous! Do we get to see the finished dresses? Hugs and joy to you! So beautiful!! The background is so pretty!! Fabulous work! So stunning! I admire your work very much. So glad you joined us at STAMPlorations January Mixed Media Challenge Thank you for playing along with us and join us in the February ‘Paint It Red’ Challenge! thoroughly enjoying your beautiful Indian themed journal pages Kate! Another FABULOUS design, filled with beautiful colors and amazing texture, Kate! That paisley just begs to be touched! I just love your style! Hugs!